Simple Kids Bubble Bath will cleanse and soothe your kid's skin with the soothing and fun bath foam. A kids bubble bath with added moisturisers and natural oils. Simple Kids Bubble Bath has a hypoallergenic formula with no unnecessary ingredients. A kids bath designed for sensitive skin, loved by all skin types. 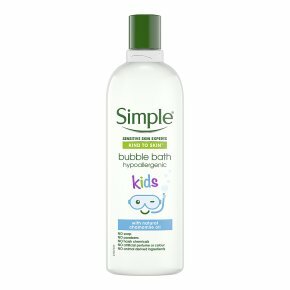 Simple Kids Bubble Bath has a gentle formula that is dermatologically tested. A bubble bath and kids body wash for kids that will make them actually want to take a bath. Simple Kids Bubble Bath was will make your kids jump at every opportunity to take a bath. Simple offers a gentle formula that has been dermatologically tested that will moisturise your kids' skin and leave them feeling refreshed and smelling great all day. Simple bubble bath and bath foam is hypoallergenic and made with clean and simple ingredients and we add moisturisers and natural oils to provide you with the best moisturising body wash we can. We take great care in making sure that we protect your childrens' sensitive skin and Simple Kids Bubble Bath is great for children and adults alike with all different types of skin. There is nothing more precious than your babies and with Simple bath products, you can be sure that their hair and skin will be healthy, soft, and clean all day. The 400ml size bottle is big enough that you won't need to run to the store all the time to buy more Simple Kids Hair & Body but not so big as to be cumbersome in little hands. We make a bubble bath and bodywash for kids that your kids will want to use because they'll love the way their skin feels and the way the smell great all day.